TechEdSat group in N-244 Lab 9 with mentors Mark Murbach (standing back left) and Ali Guarneros Luna (kneeling on right). Photo courtesy of NASA Ames Research Center. After a year of hard work, collaboration and many late nights subsisting on Costco pizzas, a group of San Jose State students, faculty and alumni gathered with guests from NASA Ames Research Center to watch the deployment of a technology education satellite (TechEdSat) from the International Space Station (ISS). At 8:43 a.m. Ali Guarneros-Luna, ’10 BS, ’12 MS Aerospace Engineering, who now works at NASA Ames as the Electrostatic Discharge (ESD) program manager for the Safety and Mission Assurance Division, called attention to screens at the front of the room in preparation of the countdown to deployment. The screens displayed a view from the space station looking down toward earth with radiant blue skies and patches of bright, white clouds. Just before the scheduled 8:45 a.m. launch the countdown came over a live stream of the deployment. A seemingly small, dark rectangular object appeared on the screen for a second, against the white clouds. 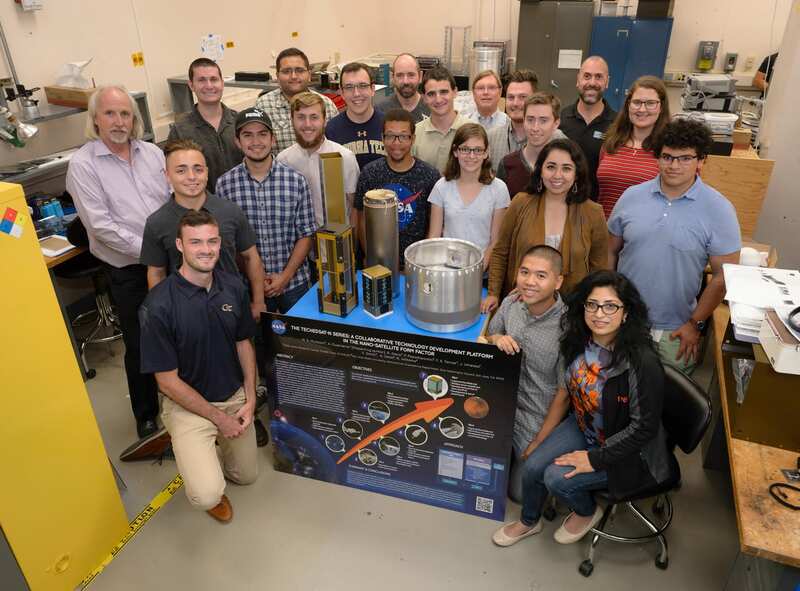 The successful deployment of the cube satellite isn’t the end of the work for the interdisciplinary student teams from the Charles W. Davidson College of Engineering and the College of Science. The next wave of work will start when they begin to collect data packets from the satellite. 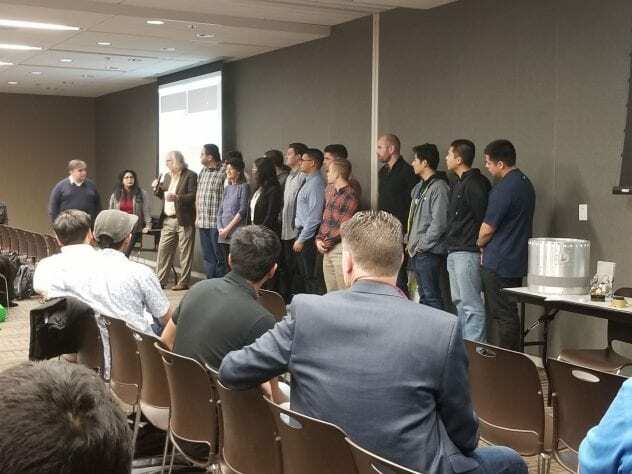 San Jose State University faculty and students gathered in the Diaz Compean Student Union Jan. 31 to watch the launch of the latest satellite created in partnership with NASA Ames Research Center. Jesus Rosila Mares, ’19 Aerospace Engineering, and his brother Roberto Rosila Mares, ’17 BS, ’19 MS Aerospace Engineering, worked together to create a virtual reality (VR) experiment for the satellite. They believe theirs is the first VR payload experiment in space and they had to turn around their hardware and software in less than six months. The two both discovered their love of engineering in high school in an AP physics class — with the same teacher. With both brothers graduating this spring — Roberto is already working and Jesus has a job lined up upon graduation — they said they will be planning to hand off their work to a new batch of students who will be able to continue it. Marcus Murbach, an adjunct professor and a principal investigator with the Sub-Orbital Aerodynamic Re-Entry Experiments, shared background on the flights series dating back to 2005. His focus has been on creating cube satellites that are smaller than traditional satellites and can be built and deployed in a shorter time. The latest satellite has a primary mission of improving the exobrake which could allow the satellite to orbit longer and better target its landing and testing three radios with the National Oceanic and Atmospheric Administration. In addition, the satellite will allow researchers to test WiFi capabilities in space, VR and more.